Another open-fronted bar has just opened in Soho: Entourage. Well, its shutters are open most evening hours before 11pm. 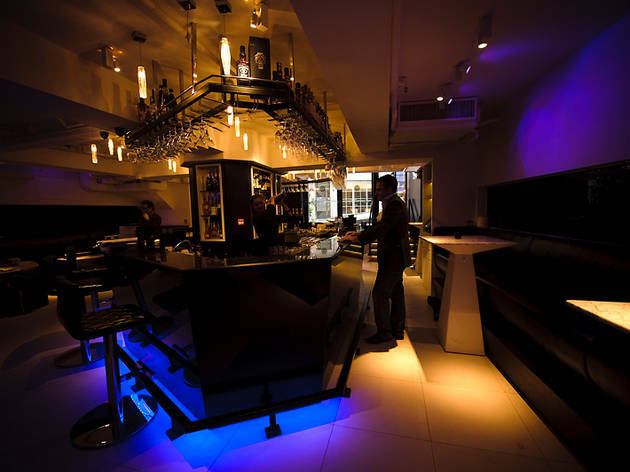 After that, when neighbourhood sound restrictions kick in, it feels more like a nightclub, as the smallish predominantly monochrome interior is dominated by a central bar and overlooked by raised back-wall DJ booth. The lounge bar up one flight of stairs opened a month before the lower bar. Drinks lists and snacks are the same in both. The upper bar, flanking Entourage restaurant, has seating around a striking partially mirrored semi-circular counter, plus low tables. But head for the tall tables and stools that line the windows with a view over the dai pai dong and strolling passersby on this stretch of lower Elgin Street. The mood up here is warmer than downstairs, with honey-toned wood, brown and white décor and Latin music playing. The lower level space is dominated by clean lines with comfy banquettes hugging the walls. The shortish cocktail list is inventive, with several sounding appealing, and all being shaken and strained with some flair behind the bar. The Elgin (all cocktails are $95) is a refreshing blend of cognac, fresh apple juice, fresh mint and champagne. Also lighter on the palate than its ingredients suggest is the Kentucky Swap – Maker’s Mark bourbon, Chambord, ginger-bread syrup, white cranberry juice and ginger ale. Cocktail prices are quite high here but most are beautifully balanced and use premium pours – Maker’s Mark, for instance is a multi-awarded boutique production drop. Some cocktails though seemed a little over-syrupped. The rather good 100% Red, blending Absolut vodka, Chambord, strawberry and raspberry purée and cranberry juice would be sweet enough without adding more sugar. Same goes for Berry Chivas: the 12-year-aged blended whisky is joined by various berries, fresh lemon and apple juice and Galliano – an unexpected satisfying mix with an alcoholic kick. A decent wine selection is offered, with nine by the glass. Twenty champagnes are listed and a handful of international bottled beers are available, with Asahi and Kronenbourg on draft. New Zealand Tahuna pinot noir, 2009 (glass: $73; bottle: $380) is a great match for much of the snack menu here which, labelled tapas, is divided into Spanish, Tunisian and French. The list is refreshed every fortnight but a few staples will likely remain. Highlights include spicy chorizo on bread ($52) – thin sliced salami rests on baguette smeared with pork rillette; mini blini with smoked salmon ($72); and beef kefta: light pan-fried beef meatballs with chilli tomato dip ($62). Chicken skewers marinated with cumin, garlic and coriander were bland, peppered up though with sautéed bell peppers on the side ($62). Hummus (with pita) was served far too cold, probably straight from the fridge ($52). 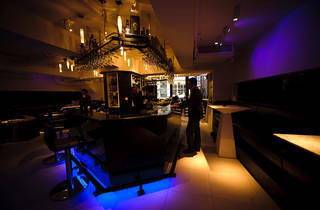 1-5 Elgin St, Soho, 2559 8281; www.entourage.com.hk. HH 6pm-9pm (ground floor; none at upper lounge bar).